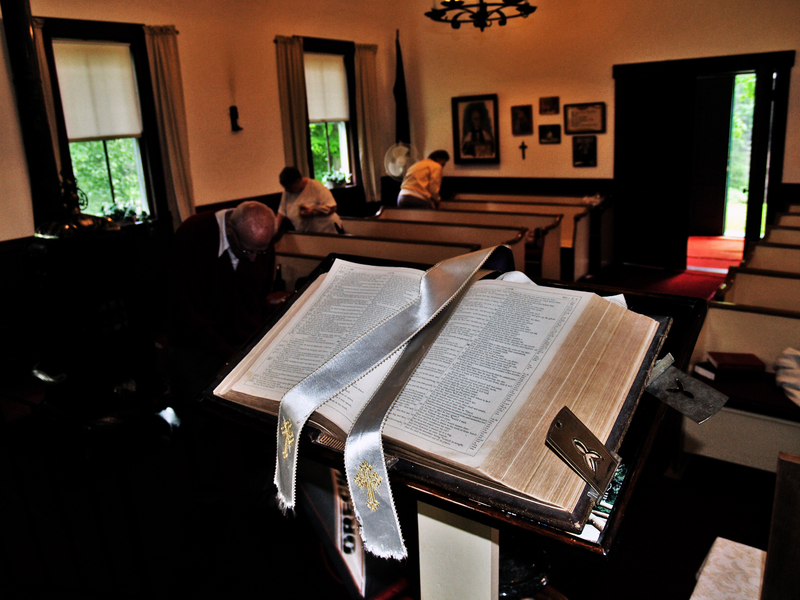 ELLSWORTH – When the last worshipper had departed this tiny church last December on the music of Christmas tidings, the candles were blown out, the few lights extinguished and the door closed tight against the winter and more than half a year. 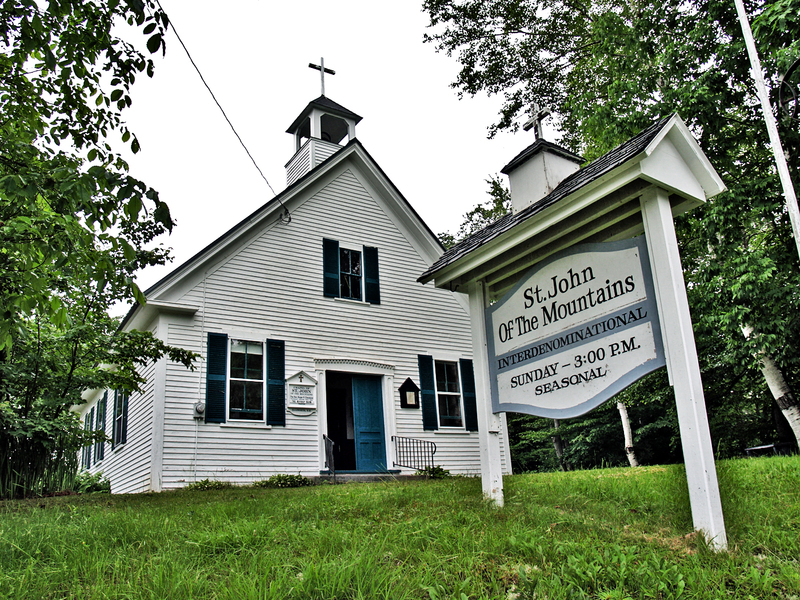 Last week, an efficient little army of volunteers threw open the doors of the Chapel of St. John of the Mountains and assessed the interior, before rolling up shirt sleeves and making it ready for those who would make their way out of Campton and beyond, up Ellsworth Hill each summer Sunday. “I don’t see any signs of mice,” one volunteer said. Like many small churches across New Hampshire, the little chapel off the beaten path in a small town that blooms in the summer is open for the season and for the next several months, pastors from away and those drawn to places that evoke a sense of the old fashioned will come here to sing, to worship and celebrate their spiritualness in a simple chapel that has been such a haven for more than 120 years. Tucked between Campton and Rumney, on the road to Stinson Lake (impassable during the winter), the chapel has survived the demise of two mills that once operated in Ellsworth, a population that once dwindled to three souls, a stint as a local headquarters for the Civilian Conservation Corps and a plan to turn it into a clubhouse. It is a testament to a man who so loved the church, that he bought it in 1940. The Rev. Roger Pecke Cleveland, Hahn explained, used to summer in the area and developed a deep affection for the church. “He bought it in 1940 and he served as pastor from 1940 to 1991,” he said. It has always been a summer church and it has always drawn ministers and priests and a changing congregation that varies from 14 to over 40, a number that puts attendance just about at standing room only. Because Pecke owned it outright, it was independent from other churches. That’s why the Sunday service is at 3 p.m. every week, to give time for people to attend their own churches, and because the chapel is not dictated by any one church, there is no set dogma. It is, and always has been, a place of worship for anyone. 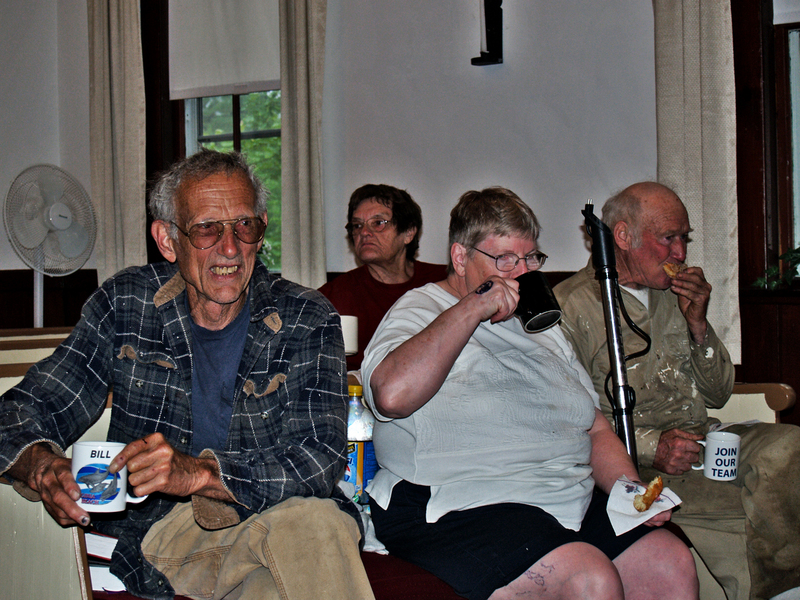 Volunteers working to open the chapel take a coffee break; from left, David Jacques, Peg Winton, Bing Rodgers and Marie Jacques. As the morning and the cleaning efforts move along, the vacuum cleaner and the lawnmower hum loudly. The little church is filled with the more earthly scents of furniture polish and window cleaner. In such a small space, everything has its place. The altar now free of dust, Hahn set up the candlesticks and the bible; a secret door on the front of the pulpit reveals other items tucked away for the winter for safekeeping. Within its own history, the chapel keeps relics from other churches. The pulpit, with its shiny patina of age, was originally from France and found its way to the mountains after a fire destroyed a congregational church in Massachusetts. The organ was a gift from a Grafton, Mass., woman and it had belonged to a teacher. The Vigil Light, legend has it, was presented by a Catholic from Germany and supposedly came via the last boat before the submarine barrier was imposed during World War II. The lectern and altar were made from the pilasters of the steeple from the Evangelical Congregational Church in Grafton, Mass., after it blew down in the 1938 hurricane. The chapel is also the keeper of a French flag that had been hidden during the occupation of Dieppe and later presented to Cleveland. Judy Rodgers married her husband in the little chapel 20 years ago and as she cleaned windows and replaced dozens of candles, she recalled the very simple reason why they did. Services are held every Sunday at 3 p.m. through Labor Day weekend and then on the first Sunday of October, November and December. The December service begins at 4 p.m. and is candlelit. Today’s (guest preacher is the Rev. Steven Veinotte of the Campton Baptist Church and a chaplain with the New Hampshire Army National Guard and veterans of the armed services will be honored.